Remember when I wrote about the mom wardrobe, way back in the spring? About how I still didn’t “have my body back,” and needed clothes for my in-between body? I was talking to my mom and sister in law a while ago about the complete lack of clothes designed for moms in this in-between stage. I know I’m not the only one who finds that going up a size or two isn’t the right fit. 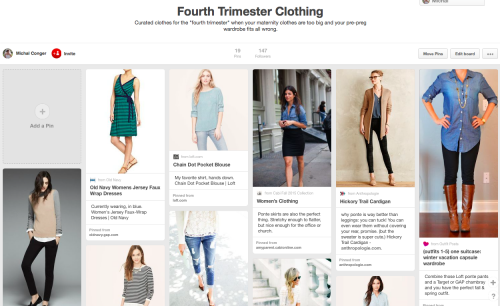 So where’s the fourth trimester clothing? It’s actually not unusual for nursing moms especially to hold onto some weight til they wean, according to my OB. That combined with lack of sleep, and little time & focus for making produce-prep-heavy meals like salads, means it’s completely normal to have a body that doesn’t feel like the old you, but is doing a pretty amazing job and deserves clothes that fit right. I’ve rounded up some of my favorite basics on my new Fourth Trimester Clothing Pinterest Board, things that I feel good wearing because they skim over love handles and hug curves and still make me look like i got dressed. I try to wear things that drape or have a shape, instead of baggy or too-big shirts, which just make me look bigger than I am. I wear a Maxi skirt or these Loft lace shorts almost every day. That or workout shorts– I’ve got to get my motivation on somehow, right? I plan to do a weekly roundup of “fourth trimester” items from my favorite places to shop– Anthropologie, Loft, Nordstrom, Target, Banana Republic, etc. If you have any favorites, please share! I got several good things from Lands End right after Zoe was born– they worked for me during that fourth trimester, and still work now that I am closer to my “normal” shape. Whatever normal is, ha. I have a short torso but a large bust (esp. with nursing), which is hard to dress, but I go for petites whenever possible, and Lands End has a lot of petite sizing. And great quality, so I know I won’t have to replace them anytime soon. I like A-line cuts, dark colors, and preppy patterns which tend to even out the bumps. 🙂 I’m with you on wanting nice tailoring or drape, rather than something really large/swingy/oversized. That stuff looks silly on me because I’m so short! This fall I’m planning to get a few long-sleeve tees in black and grey, a nice blouse or two (I like the stuff I’m seeing on the Loft website! ), and a warm, soft pair of cords. We’ll see how that goes.